I fly quite a bit for work and like everyone else — I am always curious to see who is going to sit next to me. Usually it’s someone else traveling for business and we might exchange a hello or quick conversation but that’s about it. Which is fine, because I am very productive on planes. But I must confess — I love it when a little kid sits next to me or around me. I can make faces with the best of them and now that Kelsey is all grown up — I miss playing those goofy games that only little kids can play. So when I saw the blog post Dear ‘Daddy’ in Seat 16C written by Shanell Mouland on the Good Men Project blog I could so relate to why that guy didn’t think twice about engaging with Shanell’s daughter Kate on the plane. After I read some of the moronic comments on Shanell’s original post, I felt compelled to tell the other side of the story. If I had been in seat 16C that day, here’s how I would have responded. You’re right — I boarded the plan with an agenda. I had a report that needed to be finished. All I wanted was peace and quiet so I could hit my deadline. Then I sat down next to you and Kate and in a blink, I realized the report was not going to get done. I actually want to thank you. Thank you for not assuming I was creepy or dangerous. Thanks for sharing Kate with me on that flight. You’re right — I am a little girl’s daddy. But it’s different. 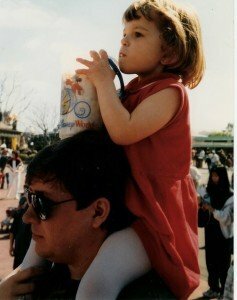 My little girl is 21 and away at school. She calls and we text and it’s all good, but I miss being a little girl’s daddy. I miss being the most important guy in her world and I miss just talking to her about whatever is in her head and heart because she will burst if she doesn’t tell me. And, I will admit to you, I miss playing Barbies. I used to be play quite an impressive Ken. Sometimes I was the hero and sometimes I was the one being rescued. And never a hair out of place. I didn’t realize Kate had autism. I just saw a cute little girl who was willing to entertain me and let me entertain her. I saw those big eyes and that blonde hair and she reminded me so much of my own little girl back in the day — I couldn’t resist. Thanks for letting me play daddy. It was much more fun than writing the report.